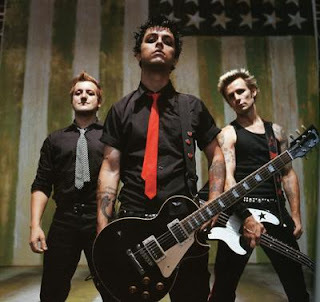 Always More to Hear: Green Day and "American Idiot" Berkeley Rep Cast to Record New Version Single "21 Guns"
Green Day and "American Idiot" Berkeley Rep Cast to Record New Version Single "21 Guns"
This is only the beginning of the staged production of American Idiot's rise in popularity. According to cast member and star John Gallager, Jr's twitter the cast of American Idiot at the Berkeley Rep went into the studio yesterday to record "21 Guns" with Green Day. It is rumored that the production will spread onto Broadway and the big screen. Personally I'm looking forward to the cast recording of American Idiot. The arrangements are spectacular. I saw the show opening night just over two months ago. READ MY REVIEW HERE and can't quite remember who sings "21 Guns" (it might have been one of the female characters), but the cast was terrific and it's bound to be good. Yet many people, When asked to identify the rights, will record only freedom involving speech ALONG WITH belief and in many cases one as well as a couple of others. there\'s no question these are ticks rights, but your full scope involving human rights can be very broad. They mean solution AS WELL AS opportunity. They mean your own freedom to obtain a great job, adopt a great career, Go with a partner of one’s selection ALONG WITH raise children. They include ones correct Human right to be able to travel widely and the correct in order to run gainfully without harassment, abuse AS WELL AS threat associated with arbitrary dismissal. They even embrace your appropriate in order to leisure. What's your favorite karaoke song to sing?